Contractors and families agree that the kitchen is the most important part of your home to remodel. This is because your home’s value typically rises with a kitchen renovation, and it is also the area which is used most in a family. The modernized kitchen has transitioned into a family and guest meeting area. This blog relays the enhancements which can be added through a kitchen remodel. Trusting your vision of the ideal kitchen in the hands of a reputable contractor is important, as you both will work together to incorporate your vision into reality. Increase Storage Options. Some kitchens are woefully short of cabinets and storage, but remodeling your kitchen will let you add more options to the space. Add more cabinets to make the most of vertical storage and maximize counter space with a kitchen island. If you’re thinking about remodeling your kitchen and updating your cabinets, consider dual storage for the most convenience and efficiency. Several options are available through custom cabinetry, which a professional home remodeling contractor can help you with. If you’re constantly running out of silverware due to lack of storage or have so much silverware that organization is unmanageable, consider dual-tiered cutlery trays. These custom cabinet drawers double the space for your silverware, keeping everything neat, organized, and at your fingertips. If your pots and pans are taking over your kitchen, or you can’t find what you want without emptying an entire cabinet, a dual-tiered cookware organizer is for you. Simply open the door and slide out the organizer. The two levels provide additional space and keep your cookware perfectly arranged. If you’ve knocked over your waste basket more times than you can count, it’s time for a custom cabinet that holds not only one but two wastebaskets. Specially designed to keep baskets upright and in place, simply slide the cabinet out when you need them, then push the cabinet back in to hide them when not in use. These are just a few ideas that will make your kitchen function more efficiently. For more information, ideas, and options, please contact us today. 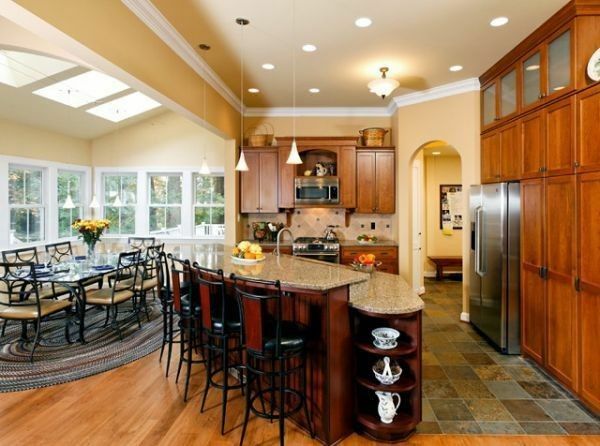 We offer various kitchen remodeling services in and around Bethesda, MD. Our unique integration of design services, along with in-house building teams, exceeds the norm. We’re devoted to the art of fine remodeling! Cabinetry, backsplash, counters, and lighting are all covered in this blog from the Pagenstecher Group’s Michael Ullrich. Resurface cabinets for a kitchen face-lift. No more cookie-cutter cabinets. Customization is the hottest trend. From color to hardware, homeowners love customizing the appearance of their cabinetry. More durable than granite and marble. Not damaged by acidic foods. With new finishing technology, options like swirl patterns and color variations enhance the popularity of this natural stone. The backsplash is an opportunity for creativity and artistry. Small, multi-color tiles create popular patterns like harlequin. Unique materials, such as glass or glistening metals, are in demand. The variations of texture and reflective properties brighten any kitchen space, a plus for a tiny kitchen. No more recessed fluorescent lighting. From traditional chandeliers to the whimsical or modern, gazebo style lanterns, minimalist pendants, futuristic metallic orbs, all are inspirational lighting ideas. Express yourself through lighting. The right lighting seals the deal, pulling together the entire kitchen design. An intelligent oven that connects to smart devices. Prepare meals from the office or patio. Speed cookers that create hot, home-cooked meals in minutes. Winepods that go beyond a vault. Just add grapes. The appliance ferments, presses, then age the grapes to create a batch of wine. Connectivity allows you to monitor every stage of production from anywhere at any time. This blog written by Michael Ullrich of the Pagenstecher Group conveys and displays that a small area does not need to be limited by thinking small. Do you feel self-conscious about your kitchen? Maybe you love to entertain but are embarrassed because you have a dated kitchen or feel you need to move to a home with more kitchen space. Just because you have a small kitchen doesn’t mean your kitchen renovation will be less efficient or stylish. Here are some basic considerations for Maryland homeowners who want to remodel a small kitchen. First, you’ll need to decide whether or not your kitchen is considered small. In most cases, a small kitchen is 10’ by 10’. This is 100 square feet or even less and is the standard used for setting the size of a small kitchen. Nevertheless, what’s considered to be a small kitchen can vary according to where you live or what you believe to be small. Small kitchens can cost less to remodel as larger renovations may entail more money for extra services, such as additional lighting, plumbing, and additional electrical services. Larger kitchens can be more expensive because they can mean using pricier materials, including custom cabinets, marble tile or stainless steel appliances. An excellent method to visually enlarge a small kitchen is by using glass, which can create a spacious feeling. This is known as incorporating “negative space.” For example, you can use glass door kitchen cabinets or have a glass countertop. Consider that glass has the ability of visually expanding space so that it looks like your glass doors extend to an adjoining room. Reflective glass tile not only adds sparkle, but it also enlarges an area. Keep this in mind when choosing a backsplash that can be stationed around a kitchen at strategic spots for creating additional lighting. Using the right colors can create a larger perception of a room. Some of the best colors for making a kitchen appear more spacious are white or light colors, as well as pastels. This is because the lighter a color is, the more it can draw the eyes upwards, giving a room more visual height. However, don’t be afraid to use bold colors because they can also work well in small rooms. There’s nothing quite like bright red cabinets, contrasted with light green walls. Just stay away from dark colors as these do better in larger spaces. Also, the light intensity of a small kitchen can be increased by wood cabinets made from tree species with brighter colors. Reserve more neutral colors for your wall paint and kitchen countertops. Instead of having several counter space sections, have only a single, but larger, countertop area. This helps in making a countertop more continuous so that it looks bigger than it actually is. One suggestion to use a sliding cutting board that goes over the sick so that it expands beyond your countertop. Usually, small kitchens have a greater length than width, although there are those that can also be square-shaped. For more storage, install rollout shelving or lazy Susans. Multitask, such as using spaces for more than a single function such as having a wheeled cabinet that can be rolled from a kitchen into a dining room for serving guests. It’s best not to have a kitchen island because it can take up too much space. Don’t allow for clutter in your small kitchen. Look for places that can be scaled down such as kitchen sinks. While farmhouse or large double sinks may work well in big kitchens, they’re not suited smaller ones. Choose a smaller dishwasher, especially if you’re single, a couple or only have a small family. Although it’s easier to cover defects in a large kitchen, it’s harder to conceal imperfections in a small area. Instead of having small floor tiles, use larger ones. Surprisingly, this can make a smaller kitchen look bigger. You don’t have to settle for an inferior kitchen. Call the professionals at Pagenstecher Group to find out about our wide range of remodeling services. Kitchen renovations are not just a job for us. They’re truly our passion. This blog from the Pagenstecher website list the top two choices for home remodeling and renovations: the kitchen and the bathroom. Given thought, most family members would agree that these two rooms are relied upon by the family as well as guests. In today’s market, you want to invest in home remodeling projects that will reinforce your home’s value. All remodeling and renovation projects require upfront costs, but there are some that can actually pad your wallets in the possibility that you may want to sell or refinance in the future. If you’re looking to renovate and get some money back, here are certain renovations that you may want to consider. Things to Keep in Mind: It’s best to err on the side of caution and renovate with familiarity in mind. Even though utilizing exotic tiles and furniture may seem aesthetically pleasing at first, they may not translate to a higher home value in the long run. Certain items may simply pigeonhole future buyers, turning them off altogether, and some renovation projects simply depreciate very quickly after a certain amount of time. It’s best to utilize moderately priced materials and finishes that are highly relatable. Try to stay away from extreme nuances and lavishness that may not add much value to your home anyway. The kitchen and the bathroom tend to be high focus areas for most housing markets. Investing in your kitchen and bathroom are surefire ways to improve the value of your home. Kitchens and bathrooms are highly personal areas that get a lot of foot traffic. The kitchen especially gets a lot of foot traffic since it tends to be the center of family time and different sorts of social interaction. In many homes, the kitchen is on the first floor of the home, connected to the living room or other large living spaces. When remodeling the kitchen, think of utilizing wooden cabinets, commercial kitchen tools, and appliances that utilize stainless steel, and natural woods as accent pieces. Whirlpool tubs have been replaced by the modern walk-in shower as the must-have fixture in a modern home. Typically, the bigger the walk-in shower (within the realm of reason), the better. Many homeowners also prefer floor to ceiling steam showers, which is a key feature that you may want to consider in future renovations. Also, consider the number of rooms that you have in your home when it comes to bathroom renovations. If you have several rooms in your old-fashioned home, but only one shower or bathroom to accommodate these rooms, it’s going to pay more to install a new bathroom altogether. Make sure to utilize competent renovators and designers that will also update plumbing. Many appraisers will take into the consideration the health of the plumbing and the home’s foundation. Many modern homes are fixed with easy fixtures that allow for straightforward modification of a home’s plumbing system. This means that they will be fewer holes and less downtime, which usually translates to straightforward costs. Less money will be spent on a labor and materials. Regardless of where you decide to invest in renovations, make sure that you brighten up the space. Utilize bright colors and hues that are complementarity to the theme in the house. Recessed lighting in the kitchen and bathrooms are modern and chic ways to brighten those areas up. Almost everyone agrees that the choice to renovate the kitchen is paramount to increasing your home’s value. Your home’s overall design has a heartbeat which begins in your kitchen. Your family and friends also congregate naturally to the kitchen, as it is the most important room in your home. Contact the Pagenstecher Group to begin turning your thoughts of an ideal kitchen into something concrete.